Red Robin must escape the most devious prison ever devised or be lost beyond time and space for eternity! Then, the spotlight turns to Clayface, who's struggling to keep his psyche together...and it's a war he may be about to lose! 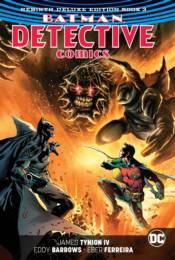 Collects DETECTIVE COMICS #963-973 and ANNUAL #1.